Many of the world’s greatest artists were inspired to create their works in response to the events happening during their lives. Share some of these famous works with your students, then help them decide what current issues they’d like to bring attention to and share in a unique work of art. 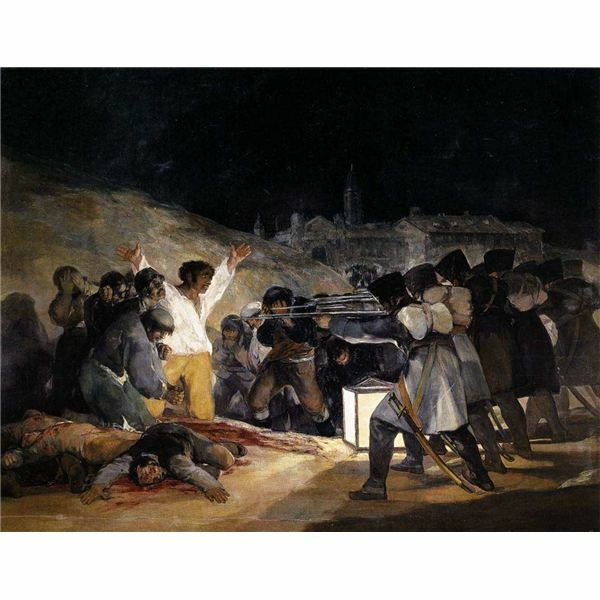 After each artwork analysis, teacher will give students an explanation of historical events or social conditions at the time each work was created, and encourage students to make connections between elements of the paintings and those events. Step Two: Brainstorm current events or social concerns with students on the board. Students will each identify their own list of important issues and decide whether they would like to make an individual collage or drawing/ painting to express their thoughts. Step Three: Students making collages will gather materials such as news articles and photos, large poster paper or board, scissors, and glue. Students who prefer to paint or draw their pieces should sketch their ideas on a large piece of drawing paper or poster paper. Students will work on individual pieces for length of time as determined by teacher. Step Four: After works are complete (and dry), students will post their works around the classroom for others to evaluate and discuss. Assessment: Students and teacher will go around and view finished pieces, and teacher will gather students around select pieces to share successful elements that helped artists communicate their concerns. Encourage students to use this experience to be more aware of their social and political opinions, and find ways to effect change in their own communities. Students who especially enjoyed the exercise might even want to approach their principal with the idea of creating a mural!